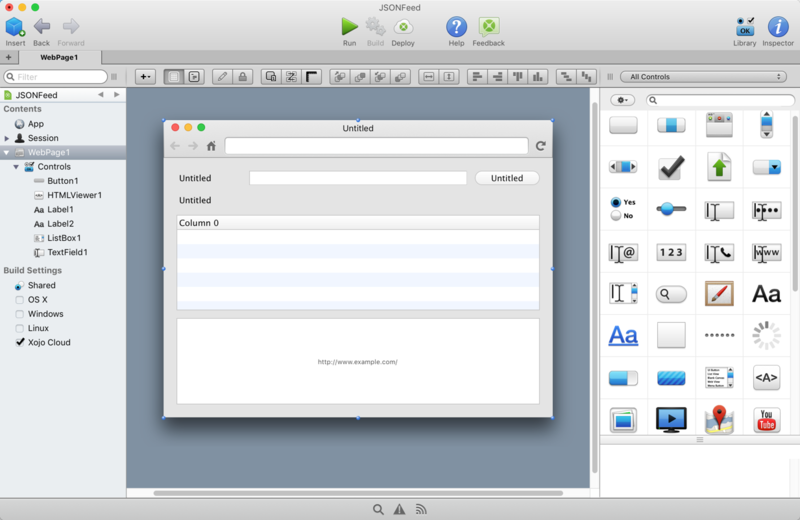 To start, download Xojo for free, install and launch it. At the Project Chooser, select “Web”, enter “JSONFeed” as the Application Name and click OK.
Now click the Inspector button on the toolbar to see the Inspector which shows the properties. You are going to want to change some properties for a few of the controls. Click on a control to see its properties in the Inspector. Change the text property for the Label next to the TextField to be “Feed URL:”. For the TextField, change its name to “URLField” and set its Text to the URL for the Daring Fireball JSON Feed: “https://daringfireball.net/feeds/json”. You’ll also want to click the right-most lock in the Locking section to allow this field to grow in size to fit the web page (Left, Top and Right should all be “locked”). Click the button and change its Caption to “Load”. In the Locking section, make sure that only Top and Right are locked. 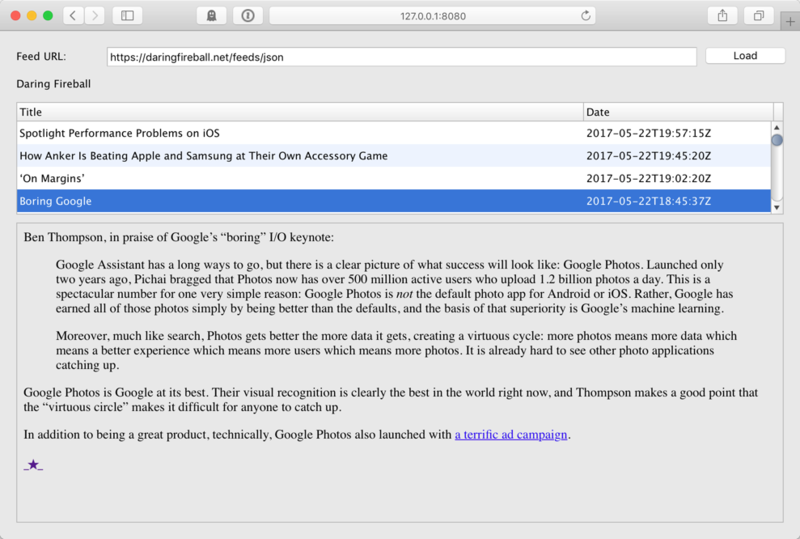 Select the Label below the TextField and change its name to “FeedTitleLabel”. Click the ListBox and change its name to “FeedList”. Also change the ColumnCount to 2 and ColumnWidths to 75%. Also set the locking so that Left, Top and Right are locked. To set the headers for the ListBox, hover the mouse over the ListBox and lick the “pencil” icon that appears. Double click on the header to edit the text and click the close icon when you are finished. Now select the HTMLViewer and change its Name to “ArticleViewer” and set the locking so that Left, Top, Right and Bottom are locked. Lastly, you want to add a non-UI control to the web page. This control is what will connect and download the JSON Feed. Click on Library in the toolbar and scroll down to find the control called “Generic Object”. Drag that on to the web page layout where it will appear at the Shelf on the bottom. Switch to the Inspector and change the control Name to “FeedSocket” and the Super to “Xojo.Net.HTTPSocket”. That’s it for the UI. You can click the Run button on the toolbar to start this web app so you can see what it looks like in your browser. It won’t do anything yet, but you can make sure all the controls are positioned properly. Now you need to put code in FeedSocket to parse the JSON Feed that gets returned. Double-click FeedSocket to display the Event Handler window, select PageReceived and click OK. The code below converts the JSON from binary data to Text, then parses the JSON in the Text to get a Dictionary. From the Dictionary you can get the array of articles in the JSON (called items), loop through them and add them to the list. With a little more work on your part, you can turn this into a full-featured JSON Feed viewer. For example, you can let users add multiple feeds and check them periodically for new posts.